Rock scored 1-9 while Connolly chipped in with 1-1 as they helped their clubs to victory. BIG GUNS BALLYMUN Kickhams and St. Vincent’s advanced to the last eight of the Dublin SFC on a busy day of action in the capital. Dean Rock kicked 1-9 for the 2012 champions as they saw off St Brigid’s by 1-16 to 0-13. Things were looking rosy for Ballymun at half-time as they led by 1-7 to 0-3, with Rock firing in the goal on 28 minutes. James McCarthy was withdrawn at the break as a precuation, with no word yet on a potential injury. St Brigid’s improved after the interval with Paddy Andrews and Kevin Bonner posting 0-7 between them, but five from Rock kept Ballymun in front. In Sunday’s second contest at Parnell Park, Diarmuid Connolly netted a goal as St Vincent’s ran out 1-14 to 1-6 winners over Na Fianna. Aaron Byrne finished a penalty to the net in the early stages, but Connolly’s goal in first-half stoppage-time left St Vincent’s ahead by four at half-time. They eased home with minimal fuss after the break. Elsewhere in the competition, Ciaran Kilkenny’s Castleknock enjoyed a 1-13 to 0-12 win over St Sylvesters, while Brian Fenton’s Raheny saw off Parnells by 2-16 to 0-7. Finally, Skerries Harps accounted for Whitehall Colmcille on a scoreline of 2-19 to 1-10. Email “Dean Rock and Diarmuid Connolly on target as Ballymun and St Vincent's progress ”. 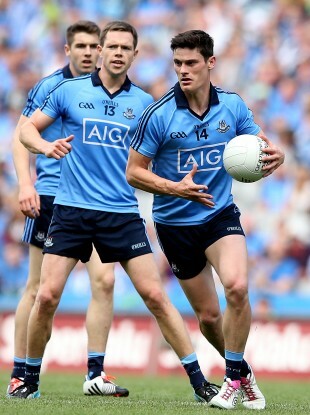 Feedback on “Dean Rock and Diarmuid Connolly on target as Ballymun and St Vincent's progress ”.